Macro Greens offers a whole green food supplementation product which is hypoallergenic (no dairy/wheat/sugar), is sweetened with stevia- balances blood sugar, contains 18.5 billion probiotics and has 5 extra digestive enzymes. These features help balance blood sugar, boost brain function, support your endocrine system, clean kidneys, and many other benefits. It’s also raw, vegan friendly, and certified organic. Tip: An important thing to keep in mind is that just because our bodies crave food and we feed it, it doesn’t mean we’re getting the right nutrients. Foods that are high in nutrients will not only fuel the body but curb unnecessary cravings. I use this green product in my smoothie. I also drink it in water to curb my sweet cravings at night. I typically like Larabar for a quick emergency snack, this year they have a new chocolate line. I’m not excited about the extra sugar in these bars. I would stick with the original flavors. There are plenty of energy and protein bar vendors here today selling products that are supposedly good for you. Even though this is a natural products expo I’ve seen plenty of artificial flavors and sweeteners in some of these bars. These bars claim to make you muscular and strong (they even have to have models to promote it!). But don’t believe the hype! Steer clear! This just reiterates that you really do need to read labels. I spoke with Rob Cheeke at the Vega booth. Looks like he is Brendans right hand man. Vega has a new sports line of products. They have a pre workout energy drink with ginger, ginseng, yerba mate, green tea, rhodiola, kombucha all for quick and sustained energy. They also have a post work out drink that contains 5 different kinds of protein and is a great workout aid! This guy is sure energized! I want whatever he is having! He is a great representative of a plant based diet and what’s a person is capable of. Not everyone aspires to be as lean and ripped as he is but we can definitely appreciate what it must take to get there. Growing Naturals produces a line of allergen-free, GMO free, raw (under 120 degrees), vegan, whole grain bio-available rice-protein drinks. It’s the only whole grain rice protein on the market right now. I didn’t know this but other brands only use parts of the rice and not the entire brown rice. This gives them the advantage of added key nutrients and amino acids that are found in the protein bran. What’s interesting about this company is that the processing that happens to create the protein concentrate is an enzyme process and it’s heated under 120 degree which keeps the rice protein in a more natural state. I had an awesome time at the expo! I can’t wait to share more product reviews with you in my next video. Thank you so much for sharing all of this. Your blog is my ‘go to’ area for inspiration and information. Excellent, I’ll keep putting the information out here for you. I’m interested in and looking for the best possible vegan protein for my buck. I’ve been doing my own searches into pea/brown rice protein powders. I’d really appreciate your input on what you think is the best for a guy who works out really hard (I’m doing Craig’s ’300′ workouts)and is very proud of the ripped physique at 47 years old. Thanks so much for your time and devotion. Thank you for the great service that you give – it used to be so hard to be vegetarian, never mind vegan! People like you bring a vegan world closer. I loved the video. I would like to see more video’s like this. I can’t always go to these events and if you could and are willing to share what’s good/bad I think that would be great. So, share more of whats emerging and what’s good and bad etc. 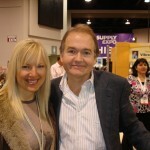 Thanks for a peek at the Natural Products Expo! Looks like a lot of fun! You are welcome! I really had a great time checking out all of the products and then sharing them with you! You are very welcome. This information is powerful and could change your life. When you change your health, you change your life. I thought SunWarrier was also a brown rice protein, and also raw. I’ve been very happy with it. Sun warrior is raw also. I didn’t find them at the expo but I recommend it also! Thanks for all the great tips. I have a question though, which has prevented me from purchasing some of your e-books. I have made the switch to a vegetarian diet with the eventual desire of moving to vegan. This is mostly due to health reasons as I can’t digest meat protein (it sits in my stomach and make me feel very ill), I’m lactose intolerant, and gluten intolerant. I’ve purchased your EVMP 2000 plan in the past, but I noticed that there is dairy and wheat items in there. What advice can you (or anyone else) offer me with all the restrictions I have (plus, I’m 5’11″ and 138 pounds and trying to gain weight which is even more of an issue). In the actual food plan I created it for vegan and vegetarians. I have put very little dairy like maybe once a week. If I put dairy in, I also give a vegan option so it is compatible for vegans and vegetarians. there are very few wheat dishes in the plan but really there are over 250 recipes portioned out for you so you can easily replace one meal with another or just replace the wheat with another gluten free grain. My suggestions- Make sure you eat consistently through out the day. Wow this video is so cool. Thank you for sharing the Expo with us. My life has greatly improved with all your recipes and helpful health tips. You are so Awe inspiring! Thanks Patrick! I’ll keep it up!